For each of his novels, Powers dives into a subject and emerges years later having examined every nuance of his latest obsession, whether it’s artificial intelligence (Galatea 2.2), neuroscience and bird migration (National Book Award winner The Echo Maker), civil rights and music (The Time of Our Singing), or genetics and DNA coding (The Gold Bug Variations). Through each of his twelve novels, Powers melds the personal with broad, sweeping cultural and environmental dilemmas that have rippling effects for large swaths of creation. It’s difficult to ascribe typical attributes to his work. Aside from tireless enquiry, depth of understanding, a gift at syntheses and a powerful intelligence matched with empathy, Powers creates in each novel something entirely new. He peoples his latest, The Overstory, with nine individuals, each broken in ordinary but devastating ways (physical disability, parent suicide, apathy, war). The first sections of the novel read like a series of thematically connected short stories that introduce each character at a crossroads, relating profoundly or tangentially to trees. The stories he tells about trees and their ability to communicate are less shocking than they might be, following several recent discipline-upending nonfiction works about these essential figures, including The Secret Life of Trees by Colin Tudge and The Hidden Life of Trees by Peter Wohlleben. It’s wrong to say that Powers invites distain for his idealists, innocents and the broken, but he doesn’t shield them from it, knowing that their stories—as they unfold individually but even more so when combined—can withstand this reticence and persuade readers beyond it. Fledgling artist Nicholas Hoel finds himself, after a horrific loss, bequeathed with thousands of photographs of the chestnut his great-great-grandfather planted. Mimi Ma, daughter of a Chinese immigrant, becomes an engineer like her father but moves far away from her roots and her family. The treasures he smuggled from his other life include three jade rings baring carved trees, one for each daughter. Adam Appich’s father plants a new tree at the birth of each of his children. Adam is intense and emotional, conflating the health of those trees with the mortality of his siblings. His sister Leigh’s elm withers shortly before she’s kidnapped and never seen again. Property lawyer Ray Brinkman and stenographer Dorothy Cazaly—“two people for whom trees mean almost nothing”—spend their first date auditioning for community theater and a life reaching toward and away from each other. Loadmaster Douglas Pavlicek crashes his plane above Cambodia on a resupply mission and is saved by a banyan. A boy falls from an oak, ruining his spine. A girl with a speech impediment follows her beloved father, an agriculture agent, soaking in his knowledge and listening to forests. A college student newly divorced almost dies after an electrical shock. When she’s revived, she hears voices telling her to protect ancient trees marked for felling. It takes the reader a while to see and appreciate the structure of this long, wending but ultimately satisfying, unsettling book. 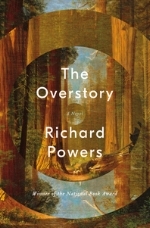 Powers’s methodical construction of his world and how its people come together to affect each other serves as a metaphor for the broad, interconnected and imperiled forest that is his true subject. Like a forest, each of these sapling humans grows in the shadow of her progenitor, then throws roots farther afield, communicating, aiding and sacrificing for others. Exploring the culture and perception of environmental activists is fraught with pitfalls. It’s effortless to mock tree-huggers in their tie-dyed clothes, unwashed hair and naïve alter egos. But Powers pushes the reader into and through these feelings without creating defined heroes or villains. Yes, the law-deflecting big lumber companies audition to fill in for the devil, but he makes clear the plight of workers on the ground, those providing for families and for our insatiable needs. Powers writes, “What you make from a tree should be at least as miraculous as what you cut down.” Through this mass of interconnected stories, he asks us to look at common objects—a table, a deck, a concrete jungle of a city, the ubiquitous “disposable” plastic cups—from the vantage point of the dwindling natural world and to feel a great shame at the thoughtless waste we create day after day. He prompts us to be changed as his characters change as they reach a closer understanding with the environment that houses and sustains them. When the characters begin to intersect, The Overstory builds in momentum and intensity to reach its core: a warning against hubris in the face of environmental catastrophe. “Earth will be monetized until all trees grow in straight lines, three people own all seven continents, and every large organism is bred to be slaughtered,” a researcher-turned-activist realizes. While many of Powers’s characters defy expectation to leave comfortable lives in order to risk contempt, assault, arrest and worse, it’s clear that human innovation, desire and consumption will outpace the world’s sustainability, and we don’t care enough—collectively and en masse—to stop it.